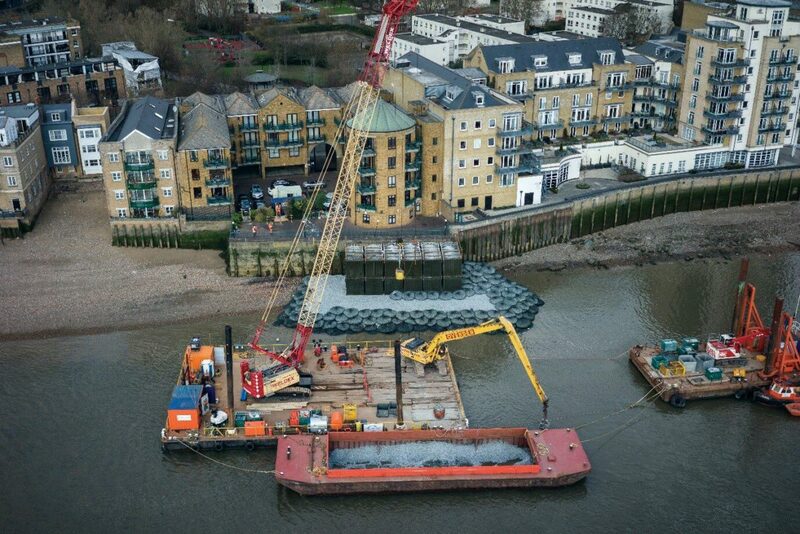 After considering the use of Kyowa Filter Unit Rockbags on other projects, the TEAM2100 team decided to use them in temporary works to support a failing wall on the River Thames. TEAM2100 is a collaborative team from the Environment Agency, CH2M and Balfour Beatty. This programme will deliver the first 10 years of capital investment in the tidal flood defences as recommended by the Environment Agency’s 100-year Thames Estuary 2100 (TE2100) plan to manage increasing tidal flood risk. The team identified a tidal flood wall in London as having been undermined because the foreshore level had lowered. This undermining caused a significant move to the structure which preventing not only a flood risk but a health and safety risk to the public and a nearby residential building. Temporary works were required to support the failing wall while a permanent solution could be put in place. The temporary works consisted of a 5.5m stone fill embankment lined out with Ridgeway’s Kyowa Filter Unit Rockbags for scour protection. This formed a platform on which 12 modified shipping containers (filled with combination of loose aggregate, void filler and concrete) were arranged to the required height. They used marine working platforms located outside the exclusion zone to undertake the works, and placed materials by a combination of crane lifts and long reach excavator. Finally props and grout bags were installed to fill the gap between the containers and wall, ready to take the load from the falling wall. The design began over the 2016 Christmas period, construction started in January and the embankment was completed in February 2017, installing and filling the containers was early march. The connection to the failing wall was made in mid-March and works completed at the end of March with the falling wall supported. Eileen Chio, Communications Lead CH2M, TEAM2100. Team: Environment Agency, CH2M and Balfour Beatty. Email: Eileen.chio@ch2m.com.